Submitted 1 month 1 week ago by Pooler 09. 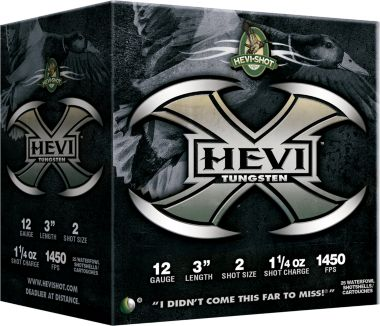 Hevi-Shot® Hevi-X Tungsten Shotshells  Per Box Fast, powerful tungsten shot Higher pellet count than steel Up to 50% more knockdown power than steel Hevi-X Tungsten Shotshells from Hevi-Shot give you the power, speed and results you expect in an incredibly powerful tungsten package. High-density loads extend your range past traditional steel shotshells and provide up to 50% more knockdown power than steel. 25 shells per box. Cancer and Reproductive Harm- www.P65Warnings.ca.gov.